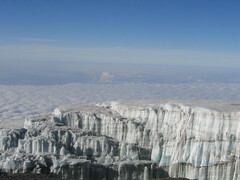 In 2005 my Dad walked up Mount Kilimanjaro. Here’s a spectacular picture he took from the summit. It’s difficult to get a true sense of scale. And having watched An Inconvenient Truth , it’s a moment in time that may never be recaptured. I envy you so, the most adventurous my mother has been is that she once went into Lidl (by accident I admit) and from what she had to say about it, you could have filmed a mini-series with the footage!